This Type I folder has no print on the outer panels. 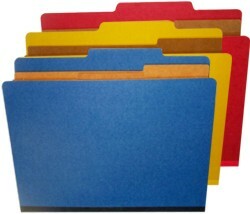 Folders are in a variety of colors. This custom application is a DV stock 2/5 Right of Center, top-tab folder. Hospitals and nursing homes file some of the following materials on their medical employees. This custom application folder would be retained on each employee for a period of 10 years. 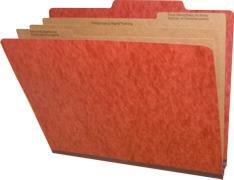 Classification 2 divider file folders allow up to six sections for forms and documents to be filed on employees.